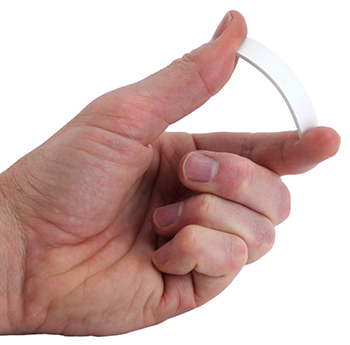 After the SlimFlex Tag Standard and the SlimFlex Tag Square, HID Global introduces another flexible and durable RFID tag, this time specifically designed for laundry applications, but well suited also for industrial applications that require a flexible, rugged and small UHF RFID tag. Providing long read range and excellent resistance to repeated washing, drying and pressing cycles, the SlimFlex Tag Laundry allows to efficiently enable automated sorting, inventory and accounting of garments in health care and commercial laundry applications. Thanks to the sizes of just 55 by 12 by 2.3 mm, the SlimFlex Tag Laundry can be discreetly sewn into the hem of clothing or linens. The durable housing, which survives repeated bending and torsion, strong impact, high pressure and temperature, aggressive chemicals and other challenging agents, makes the SlimFlex Tag Laundry suitable also for a wide range of industrial applications. This EPC Gen 2 tag provides high performance across all world’s regions with read range up to 2.5 meters on non-metallic surfaces. The used chip is the NXP UCODE G2iM that offers 256 bits of EPC memory, 512 bits of user memory, 96 bits of TID with a 48-bit unique serial number and high-end security and privacy features. HID Global can deliver the product with custom embossed or laser engraved logo. For more information about this UHF RFID tag for laundry applications, please access our RFID Tags Database or visit the HID Global website.